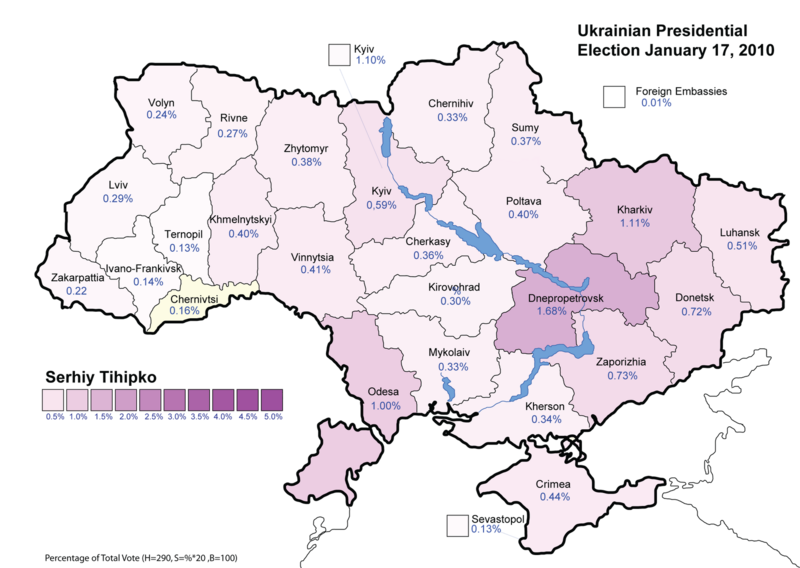 In just Seven days time Ukraine will go to the polls in what is their fourth national ballot since Viktor Yushchenko took office. Yushchenko having lost in the first round vote is now engaged in a campaign of revenge and has offered his support to his past rival Viktor Yanukovych. Yanukovych remains in poll position and is most likely to win next week’s final ballot. At the end of the first round ballot held on January 17, Yanukovych on 35.32% was 10 percentage points ahead of his nearest rival current Prime Minister and heroine of the Orange revolution Yulia Tymoshenko. The decision as who will win the final ballot will be determined by the second choice vote of 36% who supported other minor candidates. The turn out on January 17 was also at the lower end of expectation and an additional 5-7 million Ukrainians (20%) could be motivated to cast a ballot in the final round. Expectation is that Tymoshenko will fall short by 5% points. Early results will show just how close it really is. A comparison of polling pace to polling place as the results come in will show the extent of the national swing and the expected outcome of the election. A clear indication just how close it is should be known within two to three hours of the results being reported. Exit polls will also foretell the expected outcome by 8PM on Sunday February 7. Crowds will either gather in celebration or in protest. If the election result is close then Ukraine will face serious civil unrest. The winner will not stand by and allow the results to be overturned. Allegation and counter allegations of voting fraud in the first round of elections did not eventuate. No doubts these allegations will once again surface whether they have any basis of merit or not. Democracy is not only about winning elections but maintaining confidence in the process and acceptance of defeat. The Events of 2004 and again in 2007 have left a serious public distrust and loss of confidence in the political process. Ukraine is on the verge of either taking a new direction or the possibility of total anarchy. A tinder box waiting to be ignited. Ukraine’s cold winter is both a blessing and a curse. On one hand it will reduce the extent of voter participation on the other it may help quell support and protest. Supporters of Tymoshenko will not be as motivated this time round as they were in 2004. Yanukovych’s support base on the other hand will not stand by and allow the election to be stolen from their grasp. Any disputation over the election results must establish that any errors or omission in the conduct of the poll would have produced a decisive change in the overall result. It would be wrong to prosecute every single flaw in the administration of the ballot if the results would not alter had the errors or omissions not occurred. One week remaining and the battle will not be over, it has only just begun. Ukraine’s defeated Presidential candidate ,Viktor Yushchenko has in the dying days of his office declared Stepan Bandera a national hero. There was no consensus or legislative review of the presidents decree. Bandera and his organisation of “Ukrainian Nationalists” supported Hitler and his invasion of Ukraine and Russia during the second world war. His collaboration resulted in the mass murder of thousands if not millions of people. Yushchenko continues to bring himself and Ukraine into disrepute. Viktor Yushchenko lost office when he was defeated having only received 5.45% of the vote during the first round of the Presidential elections held on January 17, 2010. Present day Ukrainian Nationalist movement is headed by Australian Stepan Romaniv. The largestJewish human rights organization in the US, the Simon Wiesenthal Center, joined the chorus of those who condemn the declaration ofcontroversial nationalist leader Stepan Bandera as a Hero of Ukraine. Expressing his “deepest revulsion”, Weitzman also reminded that the late Simon Wiesenthal, who founded their organization, was born in Ukraine himself. Outgoing President Yushchenko, who lost the presidential electionson January 17, signed a decree conferring Bandera, the head of theOrganization of Ukrainian Nationalists (OUN) in 1941-1959, the statusof a national hero. Bandera’s supporters – mainly in Western Ukraine – claim he foughtfor Ukraine’s independence against both Soviet and German soldiers.However, many others in his country and Russia believe he was a warcriminal who collaborated with the Nazis during WWII and killedinnocent people. The Federation of Russia’s Jewish Communities, or FEOR, in astatement issued Monday, said Yushchenko’s move “insults the memory ofthe victims” of Nazi crimes. The document authors believe “such a political gesture is a challenge to the civilized world, to everyone who fought against Nazism” during the Second World War. According to the FEOR, “anti-Semitic and pro-Nazi”actions by the Ukrainian leadership have become rather common in recentyears. They say Yushchenko’s decree signifies “disrespect to Sovietsoldiers that his troops fought against and to all people who gavetheir lives in order to let today’s Europeans be free.”The Federation of Russian Jews believes that the next Ukrainianpresident should reverse Yushchenko’s “disgraceful decrees” and makestatements against the revision of WWII results. During his presidency Yushchenko has widely promoted Ukrainiannationalism. Previously, another leader of Ukrainian nationalists,Roman Shukhevych, was awarded the Hero of Ukraine title. On January 22, Bandera’s grandson, also named Stepan, received the award for his grandfather. Chief Rabbi Berl Lazar told RT. Following the collapse of the USSR, many former Soviet territoriesincluding Ukraine and the Baltic states have been in search of newnational heroes, he said. However, due to an “ideological vacuum”, thissearch is pretty difficult. “Their independence is quite young and these states look for new heroes among those who fought against the Soviet rule,” Glotser said. “We believe there is no reasonable or logical explanation to this and there cannot be one,” he added. Some member states of the Council of Europe have lately become moreactive and aggressive in their heroization of Fascism and revisingresults of the Second World War, the Head of the State Duma ForeignAffairs Committee Konstantin Kosachev told Itar-Tass. “Unfortunately, quite often these states use rather questionable formulations,” said Kosachev, who is also the head of the Russian delegation to the Council of Europe’s Parliamentary Assembly (PACE). “In Ukraine, Bandera is honored as a fighter for independence. In Georgia, they blow up a memorial since, they claim, it is necessary in order to make way for building a [new parliament building],” he said. According to the Russian official, the issue should be discussed openly, fairly and in an unbiased way. However, “Ukraine, the Baltic states and Georgia have many sponsors, who, for geopolitical reasons, turn a blind eye” on what is happening in these states. He said this kind of faulty policy is quite common in theinternational arena, including PACE, and vowed to continue fightingwith it by introducing relevant resolutions and condemnation of theheroization of Nazism. Meanwhile, the reaction of some in Ukraine was certainly strong.Konstantin Zarudnev, a member of the Leninsky District Council and anactivist from the Progressive Socialist Party of Ukraine burned hispassport in protest against naming Bandera a hero, Interfax agencyreports. Bandera was accused of murder and terrorism by Soviet authorities.On October 15, 1959, he was assassinated by a KGB agent in Munich,Germany. A prominent Jewish human rights organization has criticized theUkrainian president’s decision to give a posthumous award to anationalist leader it describes as a Nazi collaborator. The Simon Wiesenthal Center said in a statement Friday that StepanBandera and his followers were linked to the deaths of thousands ofJews in World War II’s early stages. President Viktor Yushchenko on Wednesday bestowed the Hero of Ukraineaward to Stepan Bandera for his role in fighting for an independentUkraine. Wednesday was Holocaust Remembrance Day. A Yushchenko spokesman declined comment. It should be noted that not only Moscow’s “political technologists,”but also a number of serious international political scientistsadvocate presidentialism, and see this form of democracy as superior toparliamentary systems – the world’s oldest democracy, the US, being theobvious example. However, concerning the specific challenges that youngdemocracies are facing, study after study have shown that the strongera new republic’s parliament is the better the chances are that genuinepolitical pluralism will survive and that the novel system ofgovernment will consolidate. Notably, these findings are not outcomes of theoreticalconsiderations by experts who may have a preference for this or thatform of government. Instead, the inference that parliamentarianism isbetter for an emerging democracy than a presidential orsemi-presidential system is based on empirical research and resultsfrom more or less wide-ranging cross-national investigations. Theconclusion for a country like Ukraine is that, in order to become amore stable and effective democracy, it should transform sooner ratherthan later into a parliamentary republic. While political conflictswill continue to be fought ferociously in such a system, they willhappen within the parliament, and not between parliament and president.Coalition building will become the major feature of the politicalprocess, and replace such strategies as brinkmanship, intimidation andbluffing prominent during intra-executive confrontations insemi-presidential systems. Parlamentarians able to build bridgesbetween political opponents and not ideologists whipping up theirpolitical camps will take center-stage. Apart from that, for Ukraine,simply saving the costs of another round of elections, and having onlyone national poll every four years will help to save much money andenergy that is dearly needed to further reform and stabilize this youngnation-state. Angus and Read is reporting a poll undertaken by the Kyiv International Sociology Institute. Methodology: Interviews with 2,002 Ukrainian adults, conducted from Jan. 4 to jan. 13, 2010. Margin of error is 2.5 per cent. This poll is hard to believe because for one it is missing the informal vote which was recorded at 1.65% not to forget Vasyl Protyvsikh vote (0.16%) in the first round, which often is rolled up into the Against All (2.21%) classification, The Poll also does not include the estimated participation rate which is equally important. Our Analysis of the first round vote indicates that the poll will be much more closer then the 15% gap indicated. For Yanukovych to to increase his vote by 20 percentage points and Tymoshenko only by 15 percentage points would indicate that she would only pick up a fraction of Tigipko’s support base and less then 60% of Our Ukraine’s 12% to 14%, 40% of Lytvyn and none of the Communist block. We believe Yulia Tymoshenko will collect more, the Against All quota will be twice that indicated in the poll and that in the final outcome Yanukovych will win by a 5% margin (44% to 49% with 6% against all – +/- 1%). Yanukovych’s challenge is to go above the 50% mark although that is not required. Under Ukrainian law the winner of the second round is the highest polling candidate. Dispelling part of the myth of east versus west in Ukrainian politics. When analysing the outcome of Ukraine’s elections you need to take into consideration the distribution of population. Ukraine’s western regions are less populated then in the East or South. This is clearly shown in the first round total vote distribution map. Donetsk is the most populous region with just over 10% of the total vote. followed by Kyiv region (which is divided administratively into two regions – Metro Kiev and the Oblast Kiev), next comes Dnipropetrovsk then Lviv and Kharkov, Lugansk and Odessa. Crimea. It is with the overall population/total vote distribution in mind that you can then look at the distribution of each candidates political support. Maps that show you the highest polling candidates based on the percentage of each candidate in relation to the regional vote are misleading. The Ukrainian presidential election, unlike the US system where state delegation plays a major role in the outcome of the election, is not based on regions. Ukraine is a single state electorate that encompasses the whole country. A regional map based on percentage per regional total seriously as opposed to the overall total vote seriously distorts the statistics presented as each state is not equal in size and/or number of constituents. As candidates often have a broad base it is for this reason that we only present maps showing the percentage of the total vote not regional summaries. Can Tymoshenko secure a deal with Sergei Tigipko to go on and win the final election? Whilst in theory it is possible the odds are against Tymoshenko who remains the underdog with Viktor Yanukovych retaining poll position. 1.Tigipko does not have a natural constituency, he is not able toinfluence voters choice as to who is their preferred candidate in the secondround ballot. they voted for him personally not his party/organisation. 2. Most if not all voters have already decided who they will support.The second round is a wast of time and limited resources. Ukraineshould have adopted a single round preferential ballot system, had they done so theresults of the election would be known by now. 3. Review of Tigipoko’s support distribution indicates that his voteswere located in the South East and Kviv metro regions. His votes camepredominately from Party of Regions, The Socialist Party and theCommunist Party (See the various Swing charts comparing the 2004Presidential and 2007 Parliamentary elections) Most of these voteswill return to Yanukovych as a second choice candidate. 5. Tymoshenko needs two out of every three votes allocated to minorcandidates in the first round in order to make up the 10% short fall.This is a big ask. It is not impossible but it is very difficult. 6. All the various public opinion polls had Yulia Tymoshenko remaining10% behind Yanukovych in a run-off ballot. Tymoshenko did pick up anadditional 5% points that were not recorded in the opinion polls. Butto make up a further 10% shortfall will be even more difficult. All analysis shows that Tymoshenko will fall 5% points behind Yanukovych. The main reason is that an additional 5% are expected to either not vote or will vote “Against all” in the final ballot. 7. Yushchenko, Yatsenyuk and Hrytsenko are advocating an “Against all“option. Whilst most will not follow their advice, the fact remains thatan Against all vote will favor Yanukovych. Under Ukrainian law the highest polling candidate wins. An against all vote will not count. Tymoshenko has a very tough battle ahead with less then 10 days remaining before the final poll. Even if she can manage to pull off a victory it will be a very tightmargin. Anything less then 0.5% will be subject to a challenge. At best Ukrainewill remain bitterly divided. With all that is at stake one and the one billion dollar cost of thepresidential campaign one has to seriously question the merit of adirect election of head of state. Ukraine would have been better off if its head of state was elected bya two-thirds constitutional majority of Ukraine’s parliament. At leastthe person elected would have represented a substantial majority ofUkraine whilst maintaining stability and democratic values. Estonia, Latvia, Hungary, Moldova, Greece, Switzerland Czech Republic and India all elect there head of state by a vote of their respective parliament. Canada, Australia and New Zealand’s head of state is appointed by the Queen of England on the recommendation of their prime-minister. Ukraine would also be better off it it abandon the Presidential system in favor of a democratic European Parliamentary model of governance. You are currently browsing the Ukraine Today blog archives for January, 2010.